Last month, numbers from the Bureau of Labor Statistics suggested that the years-long decline in public employment had finally halted, but Friday’s BLS report revealed that we moved back into negative territory in October: the public sector as a whole (federal, state, and local) shrank by 13,000 jobs. 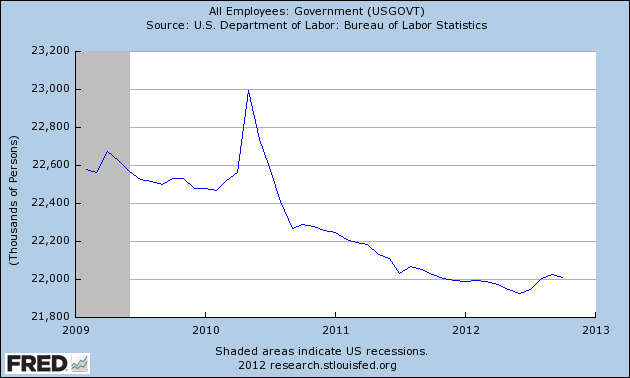 This should serve as another reminder that a significant part of this jobs crisis is self-inflicted. There is a lot of policy work that needs to be done to help bring the economy back to full employment, but one of the baby steps the government can take in dealing with the crisis is this: stop firing so many people. Employment in state and local government peaked at a seasonally adjusted 19.8 million workers in August 2008. Since then, the total is down by 697,000, or 3.5 percent. Since World War II, the only comparable decline was in 1950 and 1951, when payrolls fell by 3.7 percent. The recession left state and local governments, where most government jobs are located, in a very real budget bind, leading to a rate of layoffs unprecedented in over half a century. While the federal government also saw its revenues drop precipitously when the recession hit, unlike states and municipalities, it is currently under no economic constraint to balance its budget. The Recovery Act (ARRA) provided some aid to states and municipalities to help cover their budget shortfalls, but it was clearly insufficient, and now that the American Jobs Act (which featured further aid to states) has disappeared from the public radar there is little reason to believe that more help is on the horizon. In fact, despite all the fiscal space the federal government has at its disposal, a large(r) dose of federal austerity is scheduled for 2013 that will do even more damage to public payrolls (here’s one estimate of the damage from the Congressional Research Service). To put public job creation or preservation back on the policy radar, to begin forming a public consensus around rebuilding the public sector workforce (or just halting its demolition), there has to be some widespread acceptance of the fact that government has, in this particular sense, shrunk—and shrunk significantly—over the last four years. From a purely rhetorical standpoint, the case for direct job creation, or aid to states for direct job preservation, should be a relatively straightforward argument to present to the public (compared to, say, something like quantitative easing). But the task is made much more difficult if we’re making the arguments in a context in which everyone knows that government has become bloated during President Obama’s time in office. QUESTION: One thing that distinguishes this recovery is that public sector jobs, government jobs, have already fallen by 650,000. Given the conservative goal of shrinking government, is this a positive development or a negative one? MITT ROMNEY: Well, clearly you don’t like to hear [about] anyone losing a job. At the same time, government is the least productive—the federal government is the least productive of our economic sectors. The most productive is the private sector. The next most productive is the not-for-profit sector, then comes state and local governments, and finally the federal government. And so moving responsibilities from the federal government to the states or to the private sector will increase productivity. And higher productivity means higher wages for the American worker. All right? America is the highest productivity nation of major nations in the world, and that results in our having, for instance, an average compensation about 30 percent higher than the average compensation in Europe. A government that becomes more productive, that does more with less, is good for the earnings of the American worker, and ultimately it will mean that our taxes don’t have to go up, that small businesses will find it easier to start and grow, and we will be able to add more private sector jobs. Don’t forget! It’s the private sector jobs that pay for government workers. So if you have fewer government workers doing work more and more productively, that means private sector work will grow. To a significant extent, the trends in public sector employment over the last four years have borne a greater resemblance to the policies the Republican opposition at least claimed to support (note also the dubious claims about productivity). The election is over, and the composition of Congress looks basically the same. If blanket opposition from the House majority and Senate minority continue, states and municipalities will not get much help in rebuilding their workforces, and if the fiscal cliff is not reversed or is replaced with some other version of austerity, then the resulting macroeconomic damage will further squeeze state and local budgets, forcing them to shed even more jobs. But even if the fiscal cliff is scrapped and is not replaced with a “grand” deficit reduction bargain, and even if a combination of economic growth and federal aid to states is enough to bring the public workforce back to August 2008 levels, the previous peak (and keep in mind, the population has been growing this whole time), that will still not be enough to bring us back to full employment. To really get the economy back to operating as efficiently as it can, direct job creation has to be part of the solution. The private sector will not do the job on its own. In the context of what has happened to the public workforce over the past four years, one of the major appeals of employer-of-last-resort or job guarantee policies is that they function as the ultimate automatic stabilizer. There are different versions of the job guarantee policy, some of which involve direct hiring onto government payrolls, and others that involve federal funding to support hiring for projects run by nonprofits and social entrepreneurs. But the important point here is that the funding comes from the federal government. The fact that the bulk of the public sector workforce is employed by organizations that are fiscally vulnerable—that are users, rather than issuers of a currency—means that in the event of a substantial economic downturn, the biggest public employers in the United States will face serious budgetary pressure to make that downturn worse. Why is a jobs guarantee better than inflation/GDP-linked stipends? For advocates of the job guarantee, one of the benefits of this program, compared to a universal cash grant, is that tight full employment (ensuring a job is available for anyone who wants one) would help develop and maintain skills and labor force attachment.